Click to listen to episode (4:27). Unless otherwise noted, all Web addresses mentioned were functional as of 2-8-19. From the Cumberland Gap to the Atlantic Ocean, this is Virginia Water Radio for the week of February 11, 2019. This week, in honor of Presidents Day [on February 18], we present a revised 2014 episode about Abraham Lincoln and the James River. That sound of the James River at Richmond sets the stage for hearing the story of Abraham Lincoln’s trip to Richmond in the final weeks of the Civil War. We start with music composed in the 1860s about the hard road of conflict in Virginia in the years before the President’s visit. Have a listen for about 40 seconds. You’ve been listening to part of “Richmond is a Hard Road to Travel,” performed by Bobby Horton on the 1988 album “Homespun Songs of the C.S.A., Vol. 4.” First published in 1863, the lyrics recall the series of unsuccessful attempts by the Union Army to capture Richmond in the first two years of the Civil War. In 1861, Richmond had replaced Montgomery, Alabama, as the capital of the Confederacy, which of course made Richmond a prime objective of the Union. As our musical excerpt notes, that was a hard objective to accomplish. The James River played a large role both in Union advances toward the city and Confederate defenses of it. By the spring of 1865, Union successes allowed President Lincoln to travel to General Ulysses Grant’s headquarters at City Point, now the city of Hopewell, where the Appomattox River flows into the James. During the president’s stay from March 24 to April 8, the Union took Petersburg, leading the Confederates to evacuate Richmond, accompanied by fires and explosions set to keep materials out of Union hands. This episode replaces Episode 201, 2-17-14, which has been archived. The sound of the James River was recorded February 17, 2014, at Brown’s Island in Richmond. The island was the site of a Confederate ammunition factory during the Civil War. Thanks to Michael Martz for providing this recording. “Richmond is a Hard Road to Travel,” from the 1988 album “Homespun Songs of the C.S.A., Vol. 4,” is copyright by Bobby Horton, used with permission. Part of that piece was also featured in Virginia Water Radio Episode 164, 6-3-13, a Memorial Day episode. More information about Mr. Horton is available online at https://bobbyhorton.bandcamp.com/. 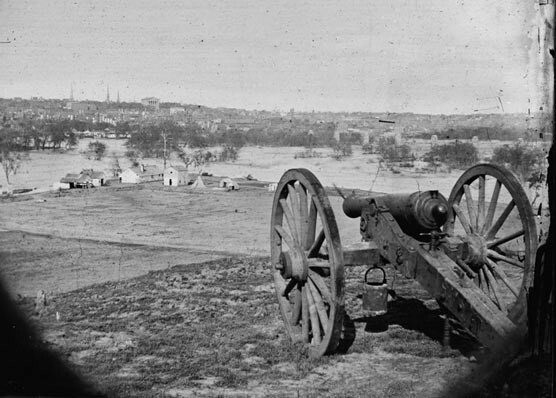 Below are four images related to Richmond during the Civil War, from the National Park Service, “Richmond National Battlefield Park/Places,” online at https://www.nps.gov/rich/learn/historyculture/places.htm, accessed 2/11/19. Specific Web addresses for each image are listed below the images. 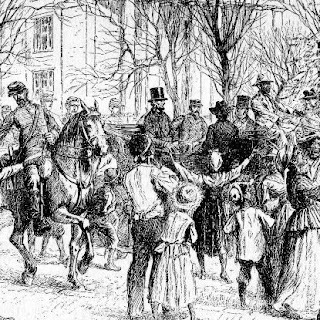 Drawing of Abraham Lincoln’s visit to Richmond on April 4, 1865. Image accessed at https://www.nps.gov/rich/learn/historyculture/lincvisit.htm. 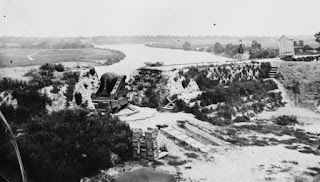 Civil War view of the James River from within Confederate Fort Darling at Drewry’s Bluff, along the river seven miles south of Richmond. Photo accessed at https://www.nps.gov/rich/learn/historyculture/drewrys-bluff.htm. Civil War view of Richmond. Library of Congress photo accessed at https://www.nps.gov/rich/learn/historyculture/richmond-story.htm. 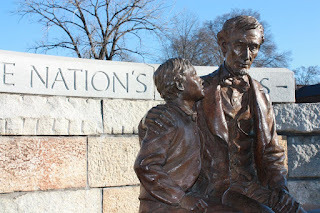 Statue by Louis Frech of Abraham Lincoln and son Tad, at the Historic Tredegar Iron Works in Richmond, placed in 2003 to commemorate Lincoln's 1865 visit to the captured Confederate capital. National Park Service photo, accessed online at https://www.nps.gov/rich/learn/historyculture/lincvisit.htm. “City Point of James River—Hopewell, Virginia,” 1 min./44 sec. video online at http://www.walkinlincolnsfinalfootsteps.com/video/grant-3/. This and other videos are part of “Walk in Lincoln’s Final Footsteps,” a joint project by the following Virginia localities: Chesterfield County, the City of Colonial Heights, Dinwiddie County, the City of Hopewell, the City of Petersburg, and Prince George County; home page at http://www.walkinlincolnsfinalfootsteps.com/. Encyclopedia Britannica, “Richmond, Virginia, United States,” online at https://www.britannica.com/place/Richmond-Virginia. The Lehrman Institute of American History, “Civil War/Entering Richmond,” online at http://www.mrlincolnandfreedom.org/inside.asp?ID=84&subjectID=3. This article is part of the project, “Mr. Lincoln and Freedom,” online at http://www.mrlincolnandfreedom.org/. More information about the Lehrman Institute’s work on Abraham Lincoln is available online at http://abrahamlincoln.org/. National Park Service/Richmond National Battlefield, online at https://www.nps.gov/rich/index.htm; and specifically “Lincoln’s Visit to Richmond,” online at http://www.nps.gov/rich/historyculture/lincvisit.htm. National Park Service/Petersburg National Battlefield, “President Lincoln Visits City Point and Petersburg—March 24-April 8, 1865,” online (as PDF) at http://www.nps.gov/pete/parknews/upload/Lincoln-at-Pete-and-CPrev2.pdf. New York Times Archive, front page of April 5, 1865, online at http://www.nytimes.com/1865/04/08/news/richmond-visit-president-lincoln-richmond-his-interview-with-prominent-citizens.html. Patrick T. Reardon. “Lincoln's Last Trip,” Chicago Tribune, 12/6/09. “Richmond during the Colonial Period, by Matthew Gottlieb, online at https://www.encyclopediavirginia.org/Richmond_During_the_Colonial_Period. All Water Radio episodes are listed by category at the Index link above (http://www.virginiawaterradio.org/p/index.html). See particularly the “History” and the “River, Streams, and Other Surface Water” subject categories (in the latter category, see the “James River” entry). Following are links to some other episodes on history at Richmond or along the James River. Episode 87, 11/7/11 – Falls of the James. Episode 265, 5/11/15 – An introduction to geography, featuring the James River watershed. Episode 273, 7/6/15 – Virginia’s Peninsula and Historic Triangle. Episode 373, 6/19/17 – James River Batteau Festival. Episode 458, 2/4/19 – History of Richmond’s James River location. Following are links to other episodes focusing on rivers in the American Civil War and the American Revolutionary War, and also featuring other music performed by Bobby Horton. Following are links to other episodes for Presidents Day or presidents’ birthdays. Episode 304, 2-22-16 – George Washington, Walter Johnson, and the Rappahannock River. Episode 355, 2-13-17 – Abraham Lincoln’s roots in the Shenandoah Valley. 8.4, 9.3, 10.3, 11.3, and 12.3 – knowledge of word origins, analogies, and figurative language to extend vocabulary development within authentic texts. VS.1 – impact of geographic features on people, places, and events in Virginia history. VUS.7 – knowledge of the Civil War and Reconstruction eras.